We all hate repetitive work right? Yes ofcourse we hate things and tasks that come and go round and round. That was a stupid question to ask 😊. Then also I asked because I know a tool which love repetitive work, Ansible 😍. There are several scenarios in a Devops environment where people do repetitive tasks which can be automated. Like adding a new feature and rolling out the updated version of there product. This task may involve copying the new application to servers and restarting the servers one by one. This is a very common task which ops do and can be automated. When tasks get automated the entire process from development to deployment get accelerated. That acceleration can decrease the time required to roll out new updated version of the app from months to weeks or weeks to days or days to hours. Sounds cool 😎. For doing automation there are many tools available like puppet, chef, saltstack and ansible. The key difference between ansible and all other automation tools is ansible is agent less. Agent less in the sense we don't need to install a client software on every nodes in a network. Ansible can communicate and configure any nodes in a network using the default ssh. Now you might be thinking it can't be used for configuring windows machine. 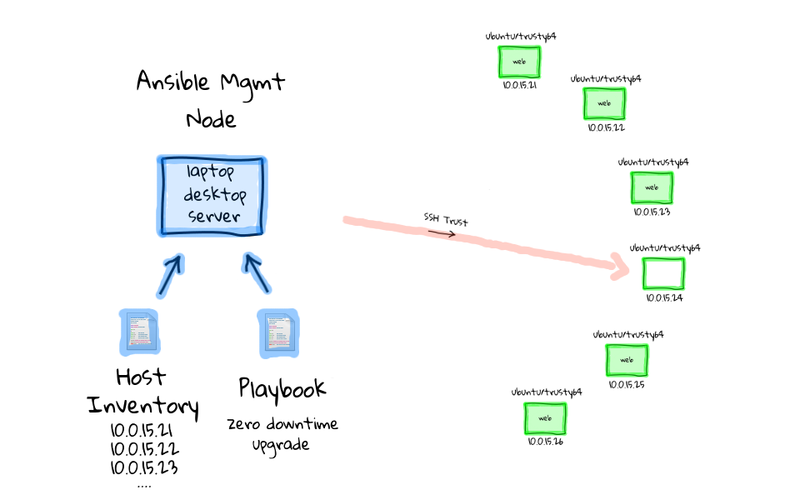 But yes it's possible in ansible by using a different connection module called winrm. The only requirement is powershell must be installed on windows machines. In other automation tools like chef or puppet we need to install some client software to make a communication with the master node which we use to automate tasks. modules : Modules are kind of functions for doing a particular task. For eg. to install a package we can do it with command module. But instead of using command module you can use yum or apt module depending on your linux flavour. After installation when you try the above statement on your terminal you can see it successfully show you the hostname. Here what ansible is doing it is making a local connection instead of ssh connection because the hostname which we are specified here is localhost. -m is for specifying the module to be used and we are using command module here. -a is for passing the arguments if any. Can i get more updates on this?